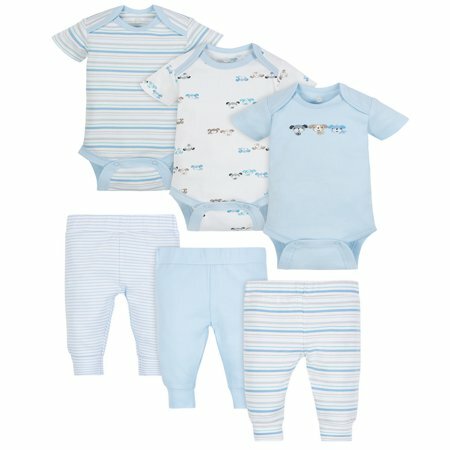 This boys' 6-piece bodysuit and pants set from Wonder Nation provides fun, new options for dressing your little one! This set includes three short sleeve bodysuits and three pairs of pants. The creative embroidery accents on the bodysuits and assortment of prints and colors on the pants make them fun favorites. You can create a variety of new outfits from the adorable items in this collection. The cotton blend rib is baby soft to keep your little one's skin feeling comfy. A touch of spandex gives this fabric excellent stretch and recovery, so it keeps its shape no matter what your little one is up to. The easy fit cut keeps up with your little one's movements during all of the day's adventures. Handy time-savers like the bodysuit's higher-in-the-front bottom snap closure makes diaper duty more streamlined. A lap shoulder neckline keeps dressing simple. Easy care fabric takes the hassle out of laundry day for busy moms! When I received the 3 pack bodysuit and boy pant, I immediately noticed that the fabric is soft, thick, and stretchy. I was excited to let my baby try the clothes so I washed and dried them. I noticed that fabric was not as thick anymore but it was still soft and stretchy. It is very easy to put the outfits (pants & bodysuit) on my baby because of the stretch and my baby looks very comfortable wearing them. I feel like he's not hot when wearing them and I don't see him scratching like when he wears other clothes that's not 100% cotton. $11 is definitely an excellent value for this 6-pack outfit and I would love to try other Wonder Nation outfits for my baby. I've washed these outfits twice already and the fabric is holding up good. Yes, I would recommend it to my friends who have babies or are going to have babies. The quality and value is better than some other name brands. I was very pleased with this product. It is a bit thin, but that makes it perfect for all the seasons except winter. It fit my son perfectly. Although it was thin, it seems to be very high quality and is so far holding up well. Plus my little guy looks just so handsome! It is super easy to put on him and he has full range of mobility. They are also easy to clean. I absolutely love this product 3 pack boy bodysuit and 3 pack for a pant bundle I have a new nephew who is a chunky little boy we have put them on him extremely comfortable to him he can still move around they are adorable the fabric is soft the quality is great. I absolutely love the 3 pack boy body suit and pant set from Wonder Nation! The fabric is thin which is perfect for summer and it's also stretchy! I can see my 12 month old son wearing these until he's 18 months or older. The colors are soft and so is the fabric. The design is very cute too! Will definitely purchase for my son and also as a shower gift. First of all for great price you get great quality as well. Plus they are so cute and you can mix and match easily. They were made from fine cotton and they fir really nicely. I have brought this brand before so I was familiar with the product. However, I was still pleasantly surprised with the accuracy of the sizes and such. The value of this product is fantastic, you get 6 pieces of quality clothing for an amazing price! I would buy all of the Wonder Nation clothing line for these prizes and quality! They wash well and are nice and soft for baby! Overall quality of Wonder Nation clothes were really good in quality. The colors are decent and the fabric is soft and comfy. The price is affordable as well. The Wonder Nation bodysuits and pants were very soft. They material felt thick and high quality. The designs were cute and being able to interchange the outfits is very convenient. There is nothing super special about this bundle pack. The material is very thin and not the softest. It would be great for the summer time but since we live in Indiana I wouldn't purchase this for other seasons. It's a great option to keep in our diaper bag as an emergency outfit. I wasn't a huge fan of them.